We are in the middle of a major shift in data center operation and technology. Several factors including the economy, virtualization, cloud computing, and green IT are all new forces for change that are driving this vision to create new data center designs and technologies. 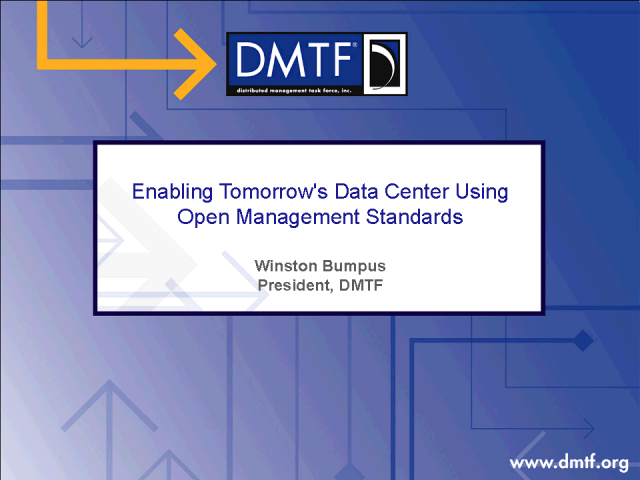 This session will review Sever, Storage, Virtualization, Cloud and Power Management issues and how emerging industry standards from the Distributed Management Task Force (DMTF) and its many alliance organizations will be a key factor in the success of the realization of this vision. Winston Bumpus, Director of Standards Architecture at VMware, Inc., has nearly 40 years of experience in the computer industry. He is currently the President of the DMTF. He has chaired activities in other standards organizations including, OASIS and The Open Group. Prior to VMware, he was Director of Systems Management Architecture at Dell, and Director of Open Technologies at Novell, Inc. He is co-author of the books "Common Information Model" and "The Foundations of Application Management." He has participated in the DMTF for over 15 years and worked on its early development of the Common Information Model (CIM) and Web Based Enterprise Management (WBEM) standards.